Paralyzed from the waist down since the age of 15, Rick Hansen’s belief that anything is possible has inspired people around the world. He is a gold-medal Paralympian, World Champion wheelchair marathoner, spinal cord injury and accessibility activist and an advocate for the power of sport. Hansen made history in 1985 to 1987 when he wheeled around the world on his Man in Motion World Tour. He traveled across four continents and 34 countries in 26 months. Hansen wanted to raise awareness and change the way people viewed those with disabilities. The tour raised $26 million for spinal cord injury (SCI) research and to make communities more accessible and inclusive. In 1985, Kinsmen and Kinettes welcomed the chance to support Hansen’s tour. Clubs held events across the country and, by the end of the tour, Kin contributed over $500,000 to his cause. The tour was just the beginning for Hansen as he continues to inspire and influence Canadians 25 years later. 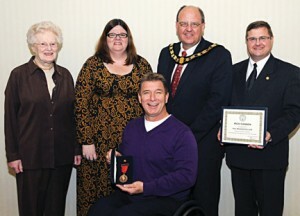 The Rick Hansen Foundation has contributed $245 million toward SCI research, rehabilitation and quality-of-life programs. The Foundation is currently leading a 25th Anniversary Man in Motion World Tour Relay that is crossing Canada in 2011-12.